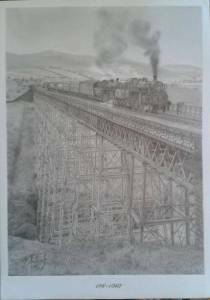 Iain has created another staggeringly good piece of railway art. Prints can be ordered through the 77021 Loco Group who will hopefully benefit from healthy sales. I’ll let Iain himself do the talking from herein! 196′-1040 was completed this morning. Belah Viaduct stood 196′ high and stretched for 1040′ across the infant River Belah in the Cumbrian Penines, the measurements lending themselves to the title of the piece. A Blackpool to Newcastle summer Saturday train is depicted crossing the deceptively weak looking structure behind a pair of standard 3MT locomotives 77002 & 77003. Available for pre order through www.77021.org and being offered to another group I support at A3 & A4 sizes it should allow both groups to raise much needed funds for their recreational aims. I will be offering A2 prints through my website once set up.